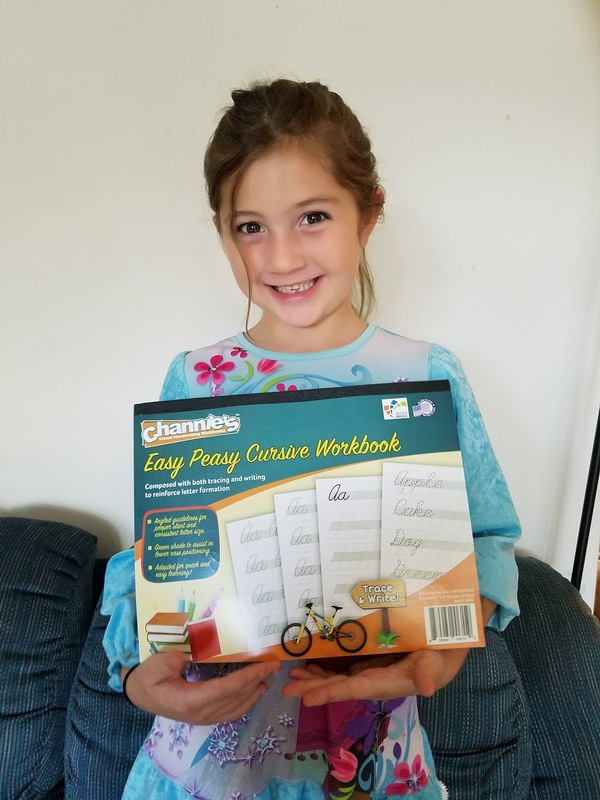 Easy Peasy Cursive Workbook is a great way to reinforce cursive handwriting from Channie's Visual Handwriting Workbooks. The grids have angled guidelines for proper angle to the letters. Colored mid area to help with proper letter size. Words are given to help practice fluency of writing. 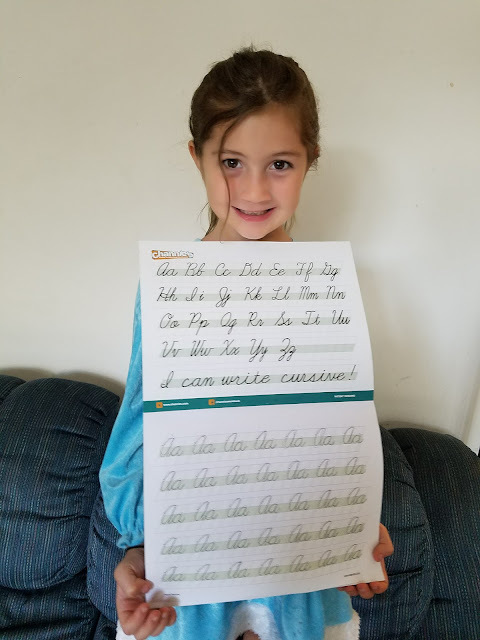 Kaelyn has never worked on cursive before so this was her first time with it. I love the way the book is set up with the angled lines and shaded portion for the lower case letters but it might not be the best book for an introduction into cursive. The book is set up in alphabetical order with some words at the end of the workbook. I would prefer it to be set up in terms of stroke. The letters l, e, and b together since they are formed similarly. Also the letters o, a, and c together and i, u, and w together. I would like upper case letters introduced at the end instead of with their lower case counterparts. I think this workbook would be ideal after all letters have been introduced. 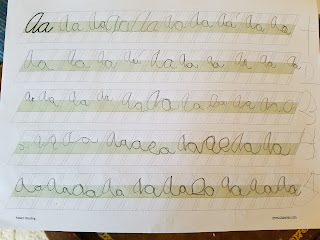 This would be a fun way to continue drilling handwriting and then moving onto some words. 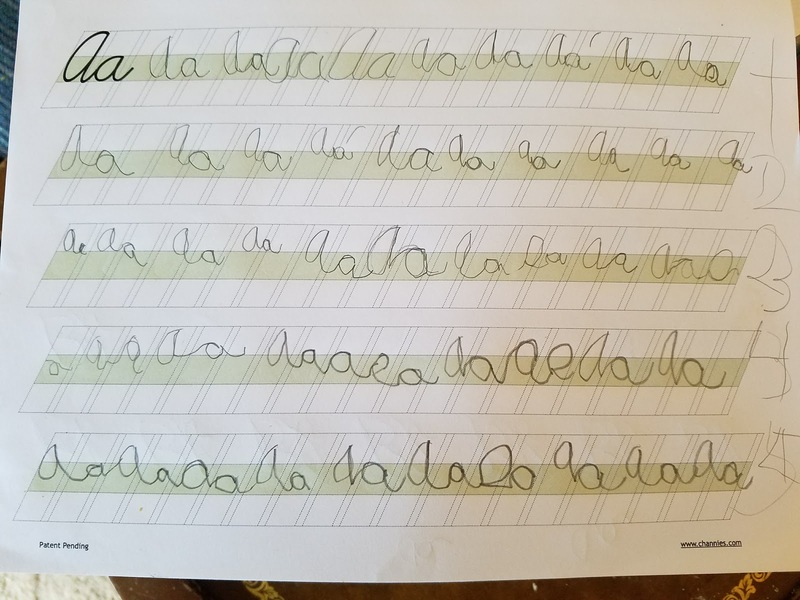 Kaelyn is having fun working on it and I don't mind her using the workbook but I did tell her next year I will be working on the individual strokes so that she learns then better. Channie's also has a Double Digit Math Problem Workbook that looks awesome! I may pick that up for Kaelyn since she just started double digit addition this week. I think that workbook would help her keep things neat and clean in math. To read reviews of this and other products like: Quick and Neat Alphabet Pad, My First Letters, Easy Peasy Alphabet, One Page a Day: Double Digit Math Problem Workbook, click the graphic below.